We have never met, Sensei, but I am a student of yours. My direct teacher is Dave Goldberg Sensei in San Diego, in the United States. 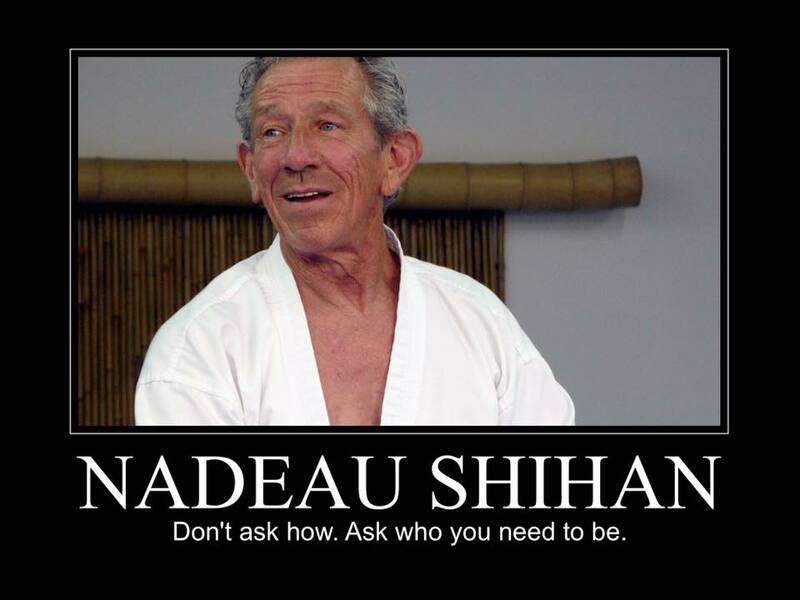 His teacher is Robert Nadeau Shihan, who I am sure you remember well. Goldberg Sensei also trained in Japan with your devoted student, Morihiro Saito Sensei. 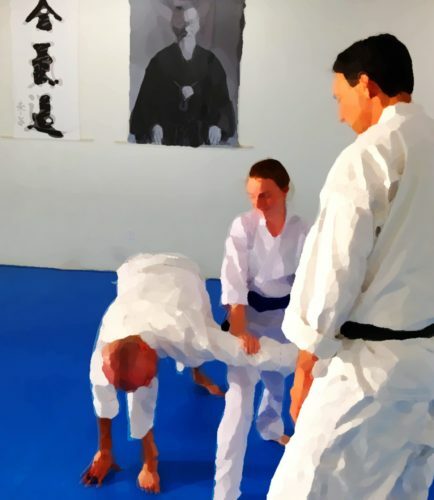 Sensei has had many teachers – he has told me about a few of them – and I have learned a bit here and there from other teachers and friends as well. There are many bubbling rivulets and quiet brooks that feed into the river that is my experience of Aikido, but they all originated with you. I owe you a debt of gratitude for this art you created. I’ve been practicing Aikido for a while now, and so thought I should introduce myself and share with you how my training is going. Today I am testing for the rank of sho-dan. Some of my friends who aren’t familiar with martial arts see earning one’s black belt as having arrived. It is an accomplishment, of course, but it feels to me like a starting point, like being accepted into a university. Commencement. “Beginning rank,” truly. It has been a great adventure getting to this point. So many hills and valleys, forks and detours, breathtaking vantage points and mysterious deep canyons. I have traveled to seminars and camps and other dojos, and made good friends from around the world. So many kindred spirits in this community! My health is much improved, to say nothing of my attitude. I never used to smile or laugh much. I didn’t even care for people, for the most part. I am not the same person who set out on this expedition. Or maybe I am, I have just set down a lot of unnecessary, burdensome things along the way. 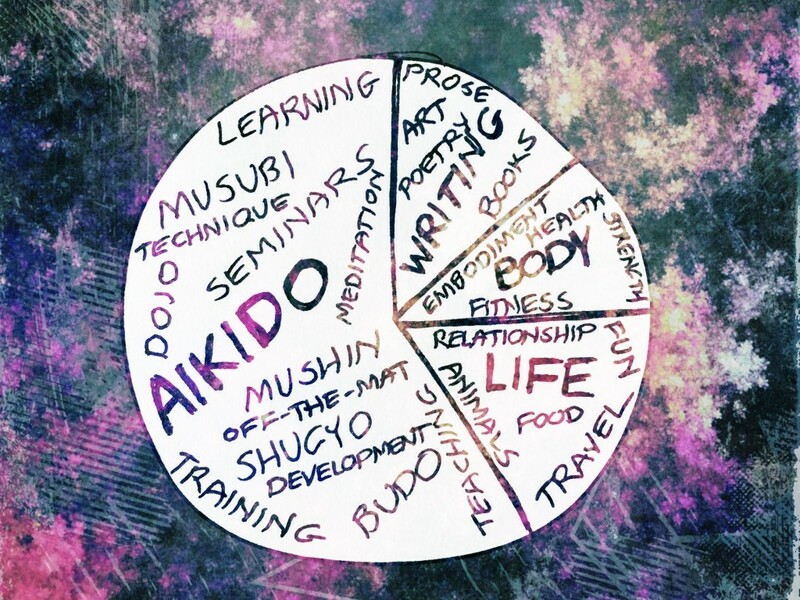 Any way I look at it, training in Aikido has been a journey of discovery. About 6 years ago a wise horseman and writer, Mark Rashid, suggested that I train in Aikido when I went to him for help with my riding. He said it could help me become the strong, clear leader my big, goofy young horse needed. That is what got me started on this path. Mark learned of Aikido from a student of his, and found the principles entirely compatible with his work with horses. I know you were a farmer at times. Did you work with horses? I often wonder if you found that to be true as well. In high school I had trained in Tang Soo Do, a hard, competitive Korean martial art. Things were tough at home. My sister’s drug and alcohol problems kept our family in constant turmoil. I was angry, and wanted to learn to hit things. Fortunately, I had an excellent teacher. Yes, he taught me how to punch (and kick), but he also taught me how to be calm and centered so I didn’t feel the need to. I left to go to college after just my first test. I always thought I would return to train afterward, but my teacher died suddenly a few years later, and I never found my way back to it. Even before, as a child – I must have been about 8 – I tried Judo for a summer. I don’t know how I heard about it, maybe at school, but I was the one who insisted in signing up. I was an eager student, and brought friends with me to train, too. But all the others in the class were boys – they refused to train with us, and the teacher allowed that. We didn’t learn much, and quit after the summer. Who knows, I might have stuck with it otherwise. I’ve seen photos of women and girls in your classes, and I know you said that Aikido is for everyone. Thank you for that. At least I learned to fall and roll that summer – I could practice that on my own. I think it saved my life once… But that’s a story for another time. I have been thinking a lot lately about the tenuous fortune and fragile connections that comprise these chains of chance encounters leading to my being here today. I met Mark, the horseman, when he led a workshop nearby, right at the moment I was having trouble and needed his help. My teacher learned of Aikido when his cousin demonstrated a simple technique at a family gathering. A young Mary Heiny, who has taught at our dojo on occasion, saw you because a friend encouraged her to observe your class, and it changed the course her life completely. How fortunate that you encountered Deguchi Sensei! And perhaps more so, Takeda. So many paths crossing, like wavy rings from stones tossed into a pond. In any case, somehow the gears of the universe meshed and turned in such a way to arrive at this state of things. Speaking of unlikely – I have been surprised again and again at the things I have learned in practicing this art of yours! It’s never been about fighting or defending myself, for me. I expected I would learn to relax under pressure, and respond from a more centered place. Indeed, I continually work on that, and like to think I am improving. I’ve seen that pushing back against … well, everything, is counterproductive and exhausting. I am more comfortable with letting things be – and letting people be – now. But I have also gotten better at being clear and standing my ground when that’s appropriate. I might expect to learn that from a martial art. But more important, I have begun to know what it is that I stand for. Your art has expanded my understanding, opened my heart, and enlivened my spirit. These have been happy, free, rewarding years. Through Aikido I have begun to discover who I am. Oh, look… I have rambled on too long! It’s time to get on the mat for my exam. Thank you for your kind attention. I’m so grateful for your vision of what Aikido could be, and how it could change people and the world. Thank you for being a teacher, and sharing with us what you discovered.